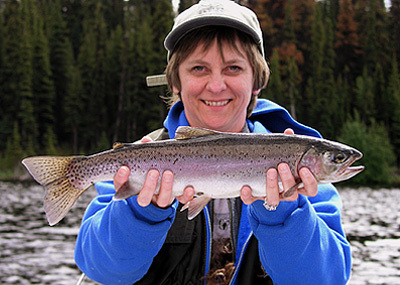 Right: A prime WILD rainbow trout caught by Cindy Trambitas during a day’s fishing at Hotnarko Lake. Left: Stream fishing has been awesome… Brian Dorsch from California on the Upper Dean, pulling his 100th cuttbow of the day. All the rain that came with June 1st was nothing but great for the lakes and streams. The Dean and Blackwater rivers rose to all record highs in June and have made for some of the very best fly fishing we have ever had. Why is that making for the best fishing? The cuttbows on the Dean and the rainbows on the Blackwater are bigger than ever. Yahoo!!! With water levels and fishin’ action like this, we only wish that there were more fishers to enjoy this amazing stream fishing. All ten stream locations that we are fishing this year have reported the biggest fish, most fish, fastest fishing… ever! The Steve Andrews group from California were here and know the waters well. Todd Nelms reported catching over 125 fish before 2:30 in the afternoon. Many fishers stopped fishing in the early afternoon sue to sore arms and satisfied numbers of fish that they lost track of counting! The biggest cuttbow reported released on the Dean this year was 20″, on the Blackwater 21″ and Hunlen is reporting a 19″ cutthroat caught and released by Debbie Sander of San Luis Obispbo, CA. Daily hatches have seen… stoneflies on the Blackwater and caddis on the Dean. These streams are not fishable without chest waders, so do remember to test them before you come up… nothing worse than leak waders! Our guide… Dan Byzyna …has been a great addition to Stewart’s Staff in 2005. We appreciate the talents and continued service of our guide of ten years, Paul Lowrie. The lake fishing is always good as we move up in elevation as the weather gets warmer… however, this year we have been able to fish anywhere, anytime, because it never warmed up. Early in June, Tony Trambitas of Olympia, WA, caught some of the most outstanding WILD rainbows that we have ever seen out of ‘secret lake #44’! Newcomers… Nic and Donna Nicholas …from Houston, Texas, enjoyed catching many WILD rainbows at our Davidson Lake outpost, and flew out on a day trip to catch dolly varden one afternoon… surprising themselves with a trophy 10 lb 6 oz’er, as well as releasing many in the 5 lb range. More fishing news… yes, there is more! We enjoyed two nights at Toms Lake outpost cabin with three days of fishing. Toms Lake 1 was a disappointment this year, with Tony catching 3 trout. However, Toms Lake 3 kept its reputation with 29 jumping, fighting fish caught and released by both of us in one day. After returning to the Lodge, we took daily fly outs to three different lakes… highlights of flights were seeing a moose and her calf from the air, flying thru a canyon – Tony was nervous! – and seeing the waterfalls. This year our favorite lake was Gatcho. We caught 27 trout and watched eagles fight over an injured squaw fish. Hotnarko Lake was windy this year, so trolling was a bit difficult, however, that didn’t stop the fish from biting. Kody, one of our dogs, stayed in Mom’s kangaroo pouch waiting to bark at fish. Andy, an annual customer of Stewart’s Lodge, finally got his wife Tricia up to the lodge to catch her first rainbow trout ever on Eliguk Lake fishing with wet flies. She also fished for her second time ever and lost track of numbers as she was mesmerized by the cuttbows that the Dean had to offer. 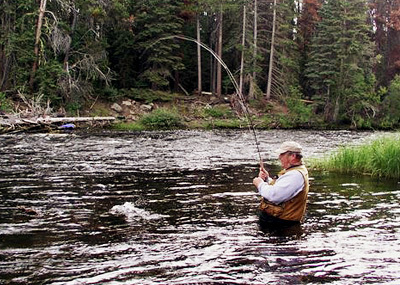 The summer has been ‘tight lines’ and ‘fish on’ for guests fishin’ WILD at Stewart’s Lodge. If you are planning a trip, layer up and be prepared for the weather… this year there’s been a fair bit of rain, but the fishing has been great …an okay trade off for the weather. We never turn away short notice bookings or parties of one. Please call 1-800-668-4335 or email us to book your trip, this season or next. We look forward to seeing you and yours on the water!